Taipei, Aug. 11 (CNA) President Tsai Ing-wen (蔡英文) said Friday that the government will use all possible means to ensure a stable electricity supply but will not consider opening the fourth nuclear power plant, which has been mothballed since 2014 amid anti-nuclear protests, according to a statement released by the Presidential Office. "The fourth nuclear power plant is indeed not an option for Taiwan. It is the case now and will remain so in the future," Tsai said during a meeting with a group of business leaders led by Lin Por-fong (林伯豐), chairman of Taiwan's Chinese National Association of Industry and Commerce. Tsai was responding to a proposal by the business leaders that the fourth nuclear power plant be put into operation to resolve the current electricity shortages facing Taiwan. They also urged the government to restart the No. 1 reactor at the first nuclear power plant and the No. 2 reactor at the second nuclear power plant, which went offline in December 2014 and May 2015, respectively, before the expiration of their service life. The president, however, argued that Taiwan's electricity supply has been tight in recent weeks mainly because the country's power transmission system was damaged during Typhoon Nesat in late July, and she stressed that the problem has nothing to do with the government's policy of moving away from nuclear power. 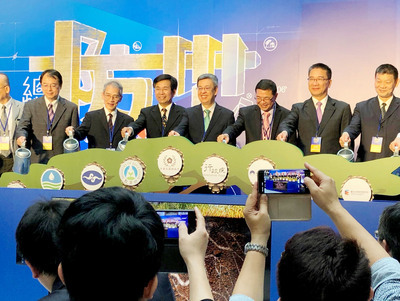 It is clearly stipulated in the Electricity Act that all operating nuclear reactors in Taiwan will be decommissioned as scheduled by 2025, she noted. "It has not been easy for Taiwan to get this far. We cannot give up our goal of a nuclear-free homeland just because of an accident," she said. In preparation for the elimination of nuclear power, the government will seek to increase electricity supplies from natural gas and renewable sources, she added. Also attending the meeting, Minister of Economic Affairs Lee Chih-kung (李世光) reiterated that the government will not consider restarting the two suspended reactors unless all other alternatives are exhausted, according to Presidential Office spokesman Alex Huang (黃重諺). Before reactivating the two reactors, the government would first seek public support and ensure they are safe, Lee said.